Twinhead Durabook series of laptop computer is designed to withstand the accidental damage or hazards that may harm notebooks during daily usage by being drop-resistance, shock-resistance and spill proof. 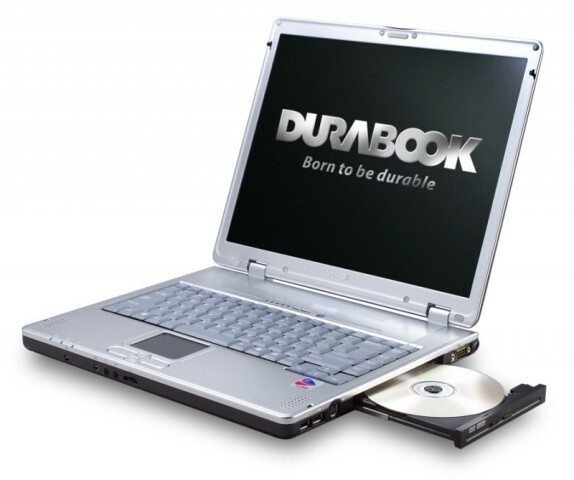 The Durabook’s rugged features include magnesium alloy case is 20 times stronger than usual ABS plastic, LCD monitor is contained in an anti-shock mounting design, while optical drives have a patented locking mechanism. These features added protection against drop, vibration & liquid spill yet is competitively priced to commercial notebooks and yet retains a slim and lightweight design allowing for ultimate portability. Twinhead Durabook R14D (Twinhead Durabook 14D) supports Intel’s Pentium M CPU and is based around the 915GM chipset. It supports SATA 150 or PATA 150, 10/100/1000 Mbps Ethernet, DDR2 533 SDRAM SODIMM, built-in internal modem, WiFi, DVD-RW Dual Drive and has a 14.1-inch XGA TFT-LCD. If you’re one of those people (or you think you might become one), give the Durabook a look.